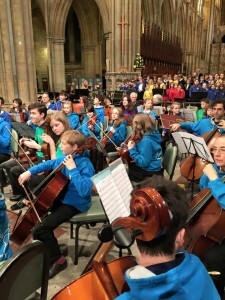 My half term started on a musical note when I attended the inaugural concert of the newly formed Cornwall Music Service Trust at Truro Cathedral. The cathedral was packed full of mums, dads and other family members, who had come to enjoy the music making of over 200 young musicians from across Cornwall. The Cornwall Music Services Trust is a charity that was set up following the closure of the music service run by Cornwall Council – it now supplies music education and teaching for over 81% of the schools in the county and over 10,000 pupils, whilst employing 77 music teachers. I am so pleased that we were able to support the creation of such a crucial service for our county’s future, and to have the CMST based at Truro School is great news for us. With the general elections fast approaching, it is encouraging to see the success of our own sixth form debaters. Last week Megan Hodges and Nini Gigani tenaciously defended their watertight model for the recall of erring politicians, and in consequence are now through to the South West area final of the ESU Mace Debating Competition held in Bristol. Good luck to them both. Young musicians playing at the inaugural CMST concert. I do hope that you are all enjoying some well-earned rest over this half term – however the school continues to be a hive of activity even without our students. On Tuesday we hosted the Chamber of Commerce Big Breakfast with over 140 men and women from the Cornish business community enjoying a full cooked breakfast whilst networking in our dining halls. The event was very well received with many compliments about both the food and the company! And throughout the week we have been running our very first swim camp for 9 to 17 year olds. The profile of swimming at Truro School is certainly on an upward trajectory and together with our excellent surf academy programme highlights our ambition in the water sports arena. No prizes for guessing that I would love rowing to become a feature as well! Ten years on and the 2nd Years’ Shakespeare Festival is still impressing audiences – indeed one new comer to the school remarked on the professional calibre of the performances of our 12 and 13 year olds. Five English classes performed their own 20 minute version of a Shakespeare play with acts from King Lear, Hamlet, Henry IV, The Tempest and a modern enactment of Romeo and Juliet. My own memories of learning parts of Macbeth as a boy are still with me and I think there is great value in committing poetry and prose to memory. There is much to pack into the final 5 weeks of the Spring term. Look out for a new initiative from our parent body, The Friends of Truro School. The FTS are keen to host some regional activities for our current parents. The geographical challenges faced by many of our families trekking into Truro from all corners of the Duchy are not inconsiderable (don’t get me started on the Trafalgar Roundabout). Through organising events in local areas there will be more opportunities for our parents to meet others near to them and enjoy time together.